A Raucous Time gets covered! Julies Hughes writes action/adventure scenes so exciting you can't get your eyes to move fast enough down the page in A RAUCOUS TIME. Two cousins set out to find a treasure lost for centuries. Wren Penderson discovers the secret in a diary written in Welsh. He steals the book from an old man. His crime results in the old man's death, his grandmother being beaten, and his cousin, Rhyllann Jones, having to make some adult size decisions against the world of international crime. Detective Inspector Crombie knows about the treasure and realizes that the boys have an agenda of their own. But trust is a fragile thing and each person has a different agenda. Wren will not tell even Rhyllann all he knows and most certainlly he will not tell the police. Adults including their own parents have seldom given either boy anything, but pain. 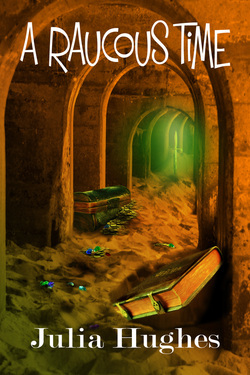 A RAUCOUS TIME is a must read with small dips into time travel and dreams. Just enough to make the characters and story line fascinatingly believable. I look forward to reading A RIPPLE IN TIME and AN EXPLOSIVE TIME, which are the second and third sections of the trilogy. Nash Black, author of SANDPRINTS OF DEATH. I started reading this at nine o'clock this morning and didn't stop to eat, drink or reprimand my children until I had finished it at 2:30. I hadn't read any of the author's other stories, and can confirm that this offering is definitely well readable as a stand alone book. Although I am eager to read the next in the series, I didn't feel I had been cheated out of an ending. I did however feel slightly miffed that I have bitten my nails (that I have been growing for weeks!) right down to the quick and had been so absorbed in the action that I hadn't noticed. The characters were well fleshed out and utterly believeable, the author paints their personalities in such a way that the reader can build up an enriched picture of the main character's lives without getting too bogged down in backstory, using small details that add authenticity. The action and suspense builds rapidly, and as soon as you are empathising with the characters they are thrown into peril. I drank this book down like a cold glass of water on a hot Sunday and enjoyed every moment of it, feeling slightly sad when I reached the end (before realising that other Celtic Cousins books were available to me now). I would definitely recommend A Raucous Time, and have in fact already lost my kindle to my son, who is devouring it now (and he would like to add that the "youthspeak" is up to date and sounds "real"). It is not often I would say that a book appeals to everybody but I would make an exception in his case. I look forward to reading more of Rhyllan and Wren's adventures, and hope Detective Inspector Crombie makes an appearance too. There are certain ingredients a story needs to make it better than just good. If any author can gather these ingredients and blend them seamlessly together, then they are always on to a winner. For me, this is my first step into the world created by author Julia Hughes, a world that revolves around two teenage boys - Wren, the geeky brainbox and his cousin Rhyllann, a pilot wannabe and Wren's best friend. Add to this, Crombie, the copper and oft self-appointed social worker, the lost treasure (a treasure that includes the fabled sword of Arthurian legend - Excalibur) of King John, and a gang of villains who will stop at nothing - including murder - to retrieve said treasure and you have a story that takes all of those ingredients, lovingly mixes them together and creates a wonderful story. Most authors would have been very happy with the fact they had created a `wonderful' story. But no. Not this author. If ever writing a novel can be compared to creating a meal, then Ms. Hughes grabbed all those correct ingredients and then, when no-one was looking, slipped in an extra, secret one that a lot of other stories lack, and created something very special. That special ingredient is - for want of a better word - love. Love of the story, love of her characters. Love of her ART. Because that's what storytelling is. It's an art and Julia Hughes is one hell of an artist! This is a story that defies genre. It cannot be labelled as simply an adventure story, or a teen angst story, a thriller or a comedy. It is all of these and more. It made me laugh out loud; it made me turn pages (well push buttons - on kindle) at speed to see what came next. There is a section of the book that in a summer (July 2012) that has had torrential rainfall here in the UK; you will feel a particular kinship with the boys. I know I did. The author has created believable characters that you will love from the off. Her storytelling is tight and flows seamlessly from start to finish. Her descriptive style pulls your imagination along and paints the places and people so vividly, they will stay in your mind long after you have closed the book or switched off your kindle. The good news is that there two other stories featuring the characters you meet in `Raucous Time'. `A Ripple in Time' & `An Explosive Time'. I have just started `Ripple' and can already announce that I love it. Make a note of the name Julia Hughes because in literary terms, it's a name I'm sure we're going to hear a lot of in the future and I genuinely cannot wait!!! If you're in the mood for a little suspension of disbelief, why not sample A Raucous Time? The story centres around a medieval mystery and a whacky theory. What if King John's treasure wasn't lost in the mud flats of the River Wash, but the wily – some say evil – Plantagenet stage managed the whole affair? Deliberately ordering an army to take a perilous short cut across an estuary, knowing the tide was due to come in – whilst ensuring that the wagons containing the entire fortune of the Angevin Empire were safely spirited away by a trusted friend or relative? It's mere speculation of course. However, "The Coinage of the British Empire" compiled by Henry Noel Humphreys in 1855 has this to say about naughty old King John: "Of the disgraceful reign of John we have some coins struck in Ireland, but no English ones, though records exist proving that coinages took place in his reign." If it's true there are no existing examples of English coins issued during John's reign, a logical explanation could be that these coins, like King John's treasure, remain lost. Or if you continue to suspend belief for a little while longer, hidden so well that this hoard of treasure will never be found. Not unless someone with an exceptional imagination knows exactly where to look. A Raucous Time synopsis: “When the final tally is counted, it will be seen that John’s vices far outweigh the virtues of other kings,” Churchill meant the Magna Carta of course. John also left another legacy though. One which has been hidden from sight for almost one thousand years. Rhyllann Jones’s geeky cousin Wren believes he can solve an ancient mystery. And he’s willing to sacrifice everything to the race to discover the fabled treasure trove of King John. Rhyllann Jones longs for a normal family life. His Mum is an animal activist, his gran is in hospital, his aunt is in prison, while his cousin insists he knows where King John's lost treasure is hidden. Somehow Rhyllann finds himself fleeing from a ruthless gang and Detective Crombie, over the wild moors of Bodmin and in more danger than he could ever imagine.